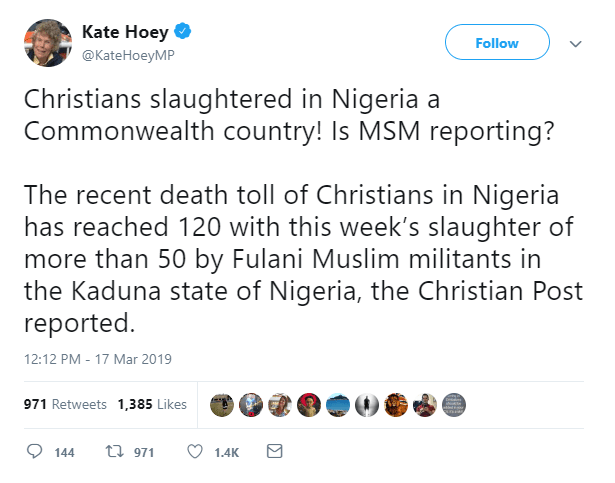 Popular Labour MP for Vauxhall has slammed the mainstream media over their lack of coverage of Christians slaughtered by Islamic Militants in Nigeria. Whilst all decent people are in agreement that Christchurch Mosque Terror attack was an atrocity many have agreed with Kate Hoey in exposing what they feel is a double standard of the mainstream media in the UK and the world. Kate Hoey also took part in the march to leave at the weekend and it is looking likely she will vote against Theresa May’s much despised Brexit deal once more increasing her popularity even further.